VietNamNet Bridge – Three forest rangers in the central province of Ha Tinh have been sentenced to between two and 12 years in jail for colluding with wood loggers to illegally cut down trees, in a trial that ended on Thursday, Jan 31. Twelve loggers were also handed down sentences, with three receiving probation and the others receiving punishments up to four and a half years in jail. 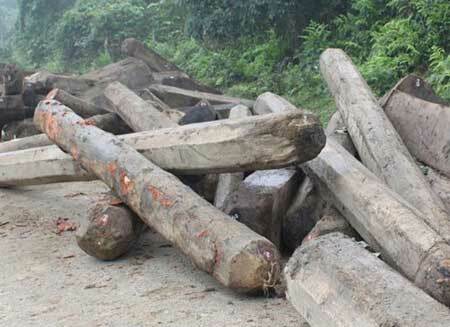 According to the verdict of the Ha Tinh People's Procuracy, nearly 717,000cu.m of timber in the forest managed by Huong Son Forest Company was illegally cut down between June 2010 and June 2011. Pham Anh Tuan, 44, was head of the forest management board at the time and the court found he had violated rules and accepted bribes, leading to "serious consequences". Tuan was given the highest penalty of 12 years in jail for allowing the loggers to cut down the trees and transport the timber out of the forest. Tuan received bribes worth VND48 million (US$2,300). The two other rangers sentenced were deputy head of the forest management board, Bui Van Thao and head of the Khe Let Forest Protection Station, Pham Nhat Tan.